Let's face it, even the best snow blower doesn't guarantee clean, dry, ice-proof pavement. As the snow melts, it runs back onto the pavement as water, and when the temperature drops, you've got a liability on your hands. The solution to this problem is the same as it's always been: salt. But how you spread salt isn't quite as simple. Here are a few ways to make it easier. 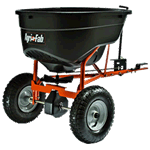 ATV salt spreaders are meant to, you guessed it, attach to the back of an all terrain vehicle. If you own an ATV, you know they serve a variety of uses. Spreading salt is one of them. Just attach a salt spreader to the back of your ATV, and salting becomes not only easy, but fun. When you've got a lot on your plate, there's nothing like killing two birds with one stone. So if you're using a walk-behind snow blower, you might as well attach a spot spreader to it and melt away whatever is left behind. That said, they're not equipped to fit all models. So before you order one, make sure it's compatible with your snow blower. Perhaps you plow with a truck, or you just have a lot of pavement to salt. Either way, tailgate spreaders are designed for the big jobs! They attach to a hitch on the back of your truck and spread large amounts of salt as you drive. They are often equipped with durable augers to chop and spread salt more efficiently. These are probably the most common spreaders you'll find. They feature two large tires and a spreader plate that turns with the axle via a set of gears. As you chug along, the salt pours out over the spinning spreader plate, broadcasting it all over to keep ice from forming on the pavement. 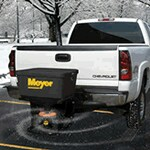 For those who have a lawn or garden tractor, you may be able to benefit from a tow-behind salt spreader. 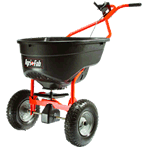 These spreaders are similar to a walk-behind spreader, but are designed to attach to the hitch of a lawn or garden tractor. With these, you can cover larger areas with ease as you clear snow with your tractor mounted snow blower. So don't just pour salt on the ground and kick it around with your boots. Take advantage of the perfect spreader to conserve salt and spread it more evenly and efficiently. 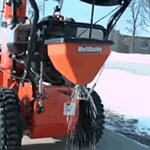 Salt Spreader Buying Guide - Find Out How to Pick the Perfect Salt Spreader. Our snowblower how-to library can help you pick the perfect single-stage snowblower, two-stage snowblower or snow blower accessory.